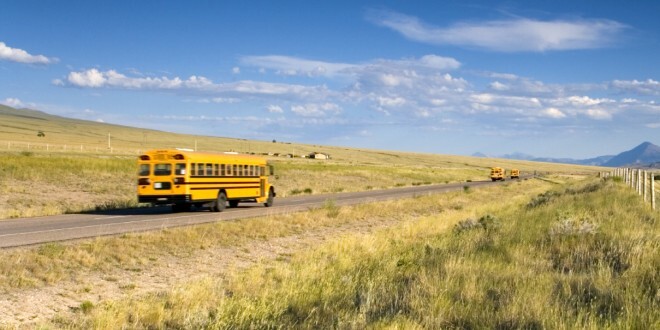 Though school districts throughout the Dakotas are diverse in many ways, troubles recruiting and retaining bus drivers are not unique. “Every place I’ve worked at, we’ve dealt with issues with buses (and) transportation,” said 22-year superintendent Terry Eckstaine, who presently works in the Ethan, (S.D.) School District. For years, the district has recruited substitute drivers right up until the start of school—and sometimes after. Now, after the loss of four drivers in two years due to issues such as retirement, moving, and health concerns, the district has cut its routes from two to one. Seventy-seven of the district’s 253 students—or 30 percent—are “bus eligible.” Eckstaine said some of those students rarely ride the bus, and others are being transported by parents until a suitable driver can be hired, but “50-some” students rely on the single bus route on a regular basis. When all of those students ride, the last one is dropped off about an hour and 50 minutes after loading the bus, but the route is averaging one hour and 10 minutes most days. One person has said he is interested in driving part-time, but so far no one has stepped up to take the position on a regular basis. At $80 per round-trip route, the job offers “not too bad of pay, but … it doesn’t pay enough to say it’s a full-time job,” Eckstaine said. Finding drivers who are available in the early morning and late afternoon, plus able to pass health, knowledge and practical tests in order to obtain commercial driver licenses with passenger and school bus endorsements, can be difficult, according to school officials in the Dakotas. Potential drivers’ health is increasingly scrutinized. Nipp said the health exams even include a stipulation that anyone whose neck is more than 18 inches in diameter must first pass a sleep apnea test. Plus, the “bus driver image” doesn’t appeal to many people, according to Eckstaine. “Some people think of it as being something that is dealing with 30 to 40 rowdy kids on a bus, which is totally a misconception,” he said. Training and—in many districts—video cameras help drivers deal with unruly kids, and behavior issues typically are dealt with swiftly. So the Ethan School District does not hesitate to suspend students from the bus, and parents have been receptive. Inclement weather can deter some potential drivers, but that rarely is an issue, according to Eckstaine. In the past, farmers and other professionals in the Langford area often drove bus routes as a supplemental job, but in recent years it has become more of a retirement position, according to Nipp. Most of the Ellendale (N.D.) School District’s seven drivers are retired and over the age of 62, but two are semi-retired and in their 50s, according to Superintendent Jeff Fastnacht. And Eckstaine said the fact that many schools rely on the help of retirees is not coincidental. “I think a lot of the older people do it as a civic duty,” he said, with the hope that someone else will step up and help transport their descendants once they are unable. In the Britton-Hecla District, however, retirees once were the norm, but now are harder to come by. Rural school district often have to get creative in tackling shortages of bus drivers. In many districts, “bus driver” is just one of many hats school personnel wear throughout a day. Ethan’s second morning route is run by a teacher’s aide who also coaches multiple sports. In the past, Ethan has successfully reached out to students at Mitchell, S.D.’s two post-high school institutions to help with its busing program, and they currently are advertising at Mitchell Technical Institute. “It worked out well, because sometimes they’re” done with classes by early-afternoon, and spending an hour or two driving bus is a good way to earn an income, without cutting too far into their study time, Eckstaine said. At Britton-Hecla, duties are split among a custodian and retired custodian, a local insurance agent, a golf course superintendent and two retirees. Two drivers—living in Veblen and Lake City—store buses at their homes to reduce mileage, but the six routes still cover a total of 350 miles. In Langford, four routes are run by one full-time driver and three teams. One route, which does not require a commercial driver’s license because it utilizes a “mid-bus,” actually is shared by 12 different individuals, including a teacher. Few students in the Agar-Blunt-Onida (S.D.) School District ride the bus regularly. One route transports students in grades 6-12 from Blunt to Onida, with morning driving duties split among a retired custodian, the school board president and a teacher, and the afternoon handled by the current school custodian. A second route is handled by a teacher who commutes from Gettysburg to Onida and picks up six kids as she passes through Agar. For all other students, or to get students to the pickup points, families arrange for their own transportation. All rural families living more than 5 miles from the school or bus stops receive compensation for transporting their children. Some districts, including ABO, have considered contracting their bus services with private companies, but that, too, can be challenging. “It’s less hassle, but more money,” according to Eckstaine. And “contractors aren’t going to have any better luck” finding drivers than schools, Pickner said, adding that Sioux Falls’ busing contractor, School Bus, Inc., is short on drivers for the first time this year, and bus contracting services are limited in South Dakota. The bigger problem, according to officials, isn’t in getting kids to and from class each day. But without additional route drivers who are available throughout the day, activities such as field trips could come to a halt in schools like Ethan. Although driving a school bus may be viewed as a minor role, Eckstaine said it is anything but that. For the most part, the driver-rider relationship is rewarding, and it extends beyond the child’s youth. In districts like Ethan, where some parents are driving so their children don’t have to ride the bus too far into the evening, the value of bus drivers is becoming clear.